The über-warm temperatures enveloping the Winter Olympics in Sochi, Russia—not surprising when the Winter Games take place in a TROPICAL CLIMATE within a climate changed environment–are becoming a big story. This provides NBC, the Olympic Network, with an opportunity to talk about climate change during the Games. Will they take it? So far, the answer is no. If the Jamaicans first attempt at Olympic bobsledding was this year instead of 1988, the Reggae Boys would not feel very out of place temperature-wise as it’s expected to be 63 F on Thursday! This should not be a surprise because 1) the Sochi, which sits in a tropical zone next to the Black Sea, summer resort capital of the former Soviet Union and now Russia, is the warmest Winter Olympic host city ever, and 2) we’re in a climate-changed environment in which winter sports in particular are facing severe challenges that will only grow over time unless we take serious measures to reverse carbon pollution, starting very soon. NBC, the Olympics network in the US, has reported that a few athletes in Sochi have said that the warm weather has adversely affected their performances over the first 4 days of competition (alpine and freestyle skiing and ski jumping mainly). They haven’t taken on the bigger picture story of climate change and its effects on winter sports. Jamie Anderson from South Lake Tahoe and the newly-minted gold medalist in Slopestyle Skiing, is avidly and openly green. My friend, and climate activist Harriet Shugarman interviewed Jamie about climate change before the Games for her terrific blog, Climate Mama. NBC, next time you talk to Jamie, ask her about climate change…or hire the Climate Mama! It would be great if NBC would see fit to interview one of these folks about climate change, even if it means one less uplifting story about an Olympic athlete overcoming [fill in the blank tragedy] airs. In fact, the opposite seems to be happening if today’s Morning Joe on MSNBC is any guide. During a discussion on the economy, one of the guests made an offhand remark about how cold it is in New York City, harrumphed about “so much for global warming” and the other guest added (with gravitas) “some are saying that a decline in solar activity is going to cause an ice age soon” (may slow the rate of warming slightly is about all that might happen). Yikes! On second thought, forget about interviewing the Eco-Olympians; NBC should just go for the Gold and air a heartwarming “Up Close & Personal” vignette about their fight against climate change! Hey Lou! Hope you are well! How ’bout the ridiculousness of holding a winter Olympics in a tropical environment in the first place? I can’t imagine that is energy efficient much less sustainable by sustainability standards. They did it in Turin, but why? Winter is winter…..athletes don’t need to be competing on fake snow shoveled in from warehouse stocks. My two cents…..greenies should be lobbying the Olympic Committee on THIS issue. Maybe the summer Olympics in Sochi instead? Speaking of which, I hope all that new semi – finished construction in Sochi gets used after the Olympics are over. It’s not exactly a sustainable tourist location, just a big Russian PR ruse. Can we incorporate long-term viability of Olympic investment into OC decisions? Marisa: Great to hear from you and thanks for the comment. Of course it was just a dumb, craven decision by the IOC–and that’s saying something for an organization that should have Dumb & Craven as part of its name the (ID&COC?). Somehow I think Russian rubles had lots to do that decision–and the decision of FIFA to award the 2018 World Cup there. The ID&COC talks a good sustainability game, and in some cases, awards the Games to cities with strong sustainability programs (London 2012, for example). But other times, as with Sochi 2014, it ignored sustainability (other bid cities were Pyeongchang, S. Korea–which ultimately won the 2018 Games, and Salzburg, Austria). Sochi defenders will cite their sustainability plan–which looks good on paper–but, well, let’s just say there’s some serious greenwashing going on there. Don’t wanna believe me? Here’s some detail from The Green Market Oracle: http://networkedblogs.com/TzpfE. Rio seems to have done some great things, sustainability-wise, for the 2016 Summer Games. And Pyeongchang is actually one of the few Winter Olympic sites (23 so far) that is expected to be able to host a Winter Games, climate-wise, by 2100. So maybe they’ll go back there. I’m afraid this will turn out to be another missed opportunity. The focus on SPORTS sometimes encourages the attitude that nothing else matters. 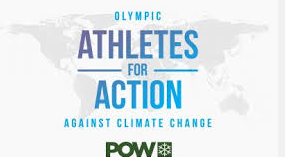 However, if the athletes bring it up NBC will be sure to cover the climate crisis in the Olympic locale. Let’s up the Olympians take the lead. I’m going to keep checking throughout the Games (via Google and elsewhere) to see if climate change gets brought up on NBC’s broadcasts. If it gets discussed, I’ll blog about it. HEY This is my favorite green site since I love both sports and the green cause. And I love your enthusiasm as well, since a lack of public awareness CAUSES the problem. HOWEVER, pointing to the warm weather at Sochi might be construed as similar to pointing to the cold winter in the Northern hemisphere. Neither are evidence that the global average temperature has risen or fallen in the last year, as we know that such a change would be imperceptible to the average viewer. At best, one can argue a greater temperature variability, but this is even a statistically more difficult argument to make y looking at the variance of temperatures. temperature change is a slow, but dangerous phenomena – the slowness of temperature change lulls people into complacency and increases its potential danger! I have a related post on your next item. LOVE THE SITE! Great comment John. Thanks for the compliment about the blog and for all of your comments–they are always insightful, always make me think. You are right–and I’m sorry if I gave the impression that climate change is the main cause for the warm weather in Sochi. The main reason is that Sochi is in a tropical environment–a very dumb place to have a Winter Olympics. My point in this post was to say that NBC Sports could use the warm weather at Sochi as a platform from which to address the longer term problem of climate change–which is posing and will continue to pose an adverse–and perhaps an existential threat–to winter sports. To me this is newsworthy, especially given the athletes who are engaged in the green-sports movement. But I’m not surprised NBC has ignored the topic (unless I’ve missed it). Today, NBC News had a “debate” on Meet The Press about climate change–with Bill “The Science Guy” Nye (who, while a scientist and someone who supports the consensus, is not a CLIMATE scientist) vs. Rep Marsha Blackburn (R-TN), an opponent of climate change. Having a climate change “debate” on the most important weekly news show basically makes it seem as there’s an issue of the climate change’s existence. Which is settled science. Thanks Marisa for the link. Great article.